Vancouver, British Columbia native Martha Sturdy creates fantastically bold artworks and home furnishings that are recognised internationally for their creativity and excellence. In the early days of her career, Sturdy designed and produced small-scale wearable sculpture and jewellery, but soon moved on to art, furniture, and accessories of all shapes and sizes. Her web gallery of work shows that this Canadian designer is endlessly creative, and multitalented, but her unique lighting designs truly stand out. Favouring hand-cast and poured resin, wood, and metals, Sturdy has formed an impressive array of elegant and artistic light fixtures for the modern home. Since ancient philosophers began to study the planets and stars of our solar system, the beauty of the heavenly realm has been a source of inspiration to humans. 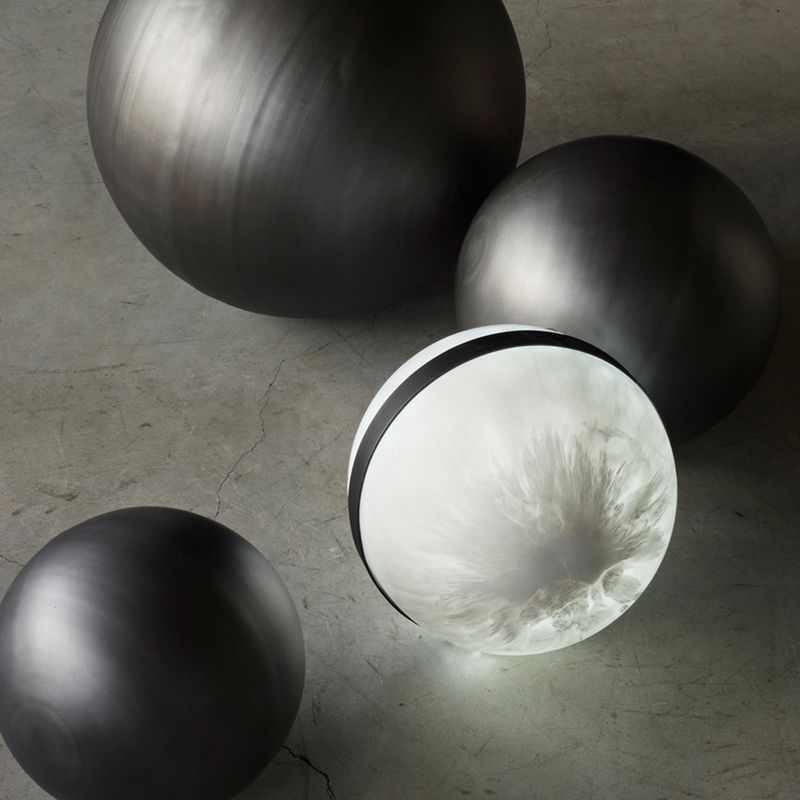 The “Lunar Illuminated Sphere”, (below) available in three sizes, comprises a smooth resin sphere with a modern steel band. Sitting on a brass base, the 15”, 24”, and 37” spheres look spectacular grouped together, yet are simple and stunning alone. This lamp would be the perfect decoration piece for a romantic moonlit meal, no matter how cloudy the sky is outdoors! 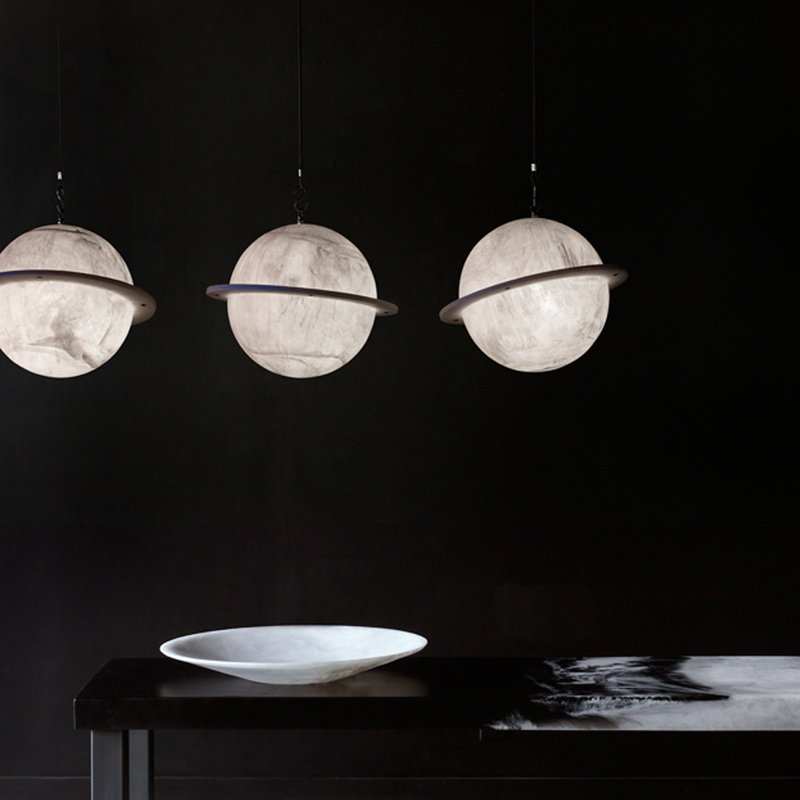 Continuing the celebration of the celestial, the “Globe Light” creates an impressive and unique display of an illuminated planet in your home. Both “warm” and “cool” coloured bulbs can be used in this fixture, as well as multiple colours of resin, allowing you to order a glowing approximation of Neptune or a shimmering Saturn. 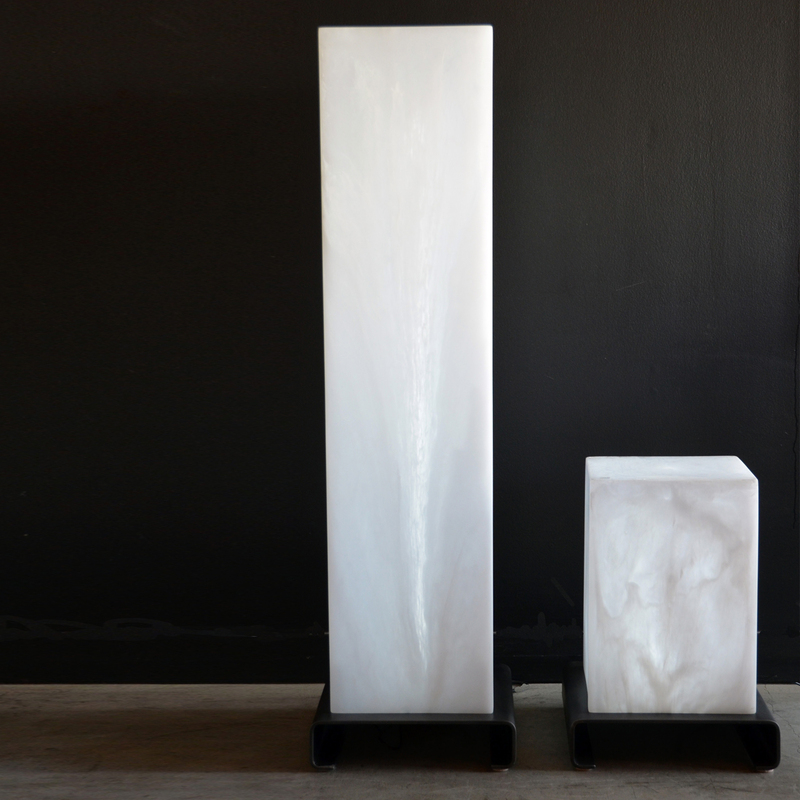 The “White Marble” resin on this piece is perfect for the minimalist astronomer/decorator and gives the piece a texture that suggests a rugged lunar landscape. There is no need to visit a professional observatory when Martha Sturdy’s outer space inspired products allow us to go stargazing from the comfort of home! Inspired by another wonder of the galaxy, the northern lights, the “Aurora Lamp” (pictured below) stands tall on its steel base, with a rectangular resin shade. When grouped, these boxy pillar-like forms bring to mind a softly glowing cityscape of skyscrapers. It is amazing how this lamp’s design can reflect both a dazzling phenomenon of the cosmos and the terrestrial elements of the Anthropocene that we live in. This duality is carried off effortlessly in the “Aurora Lamp”. Out of the entire line of amazing lighting designs, I think that this one is the show stopper. 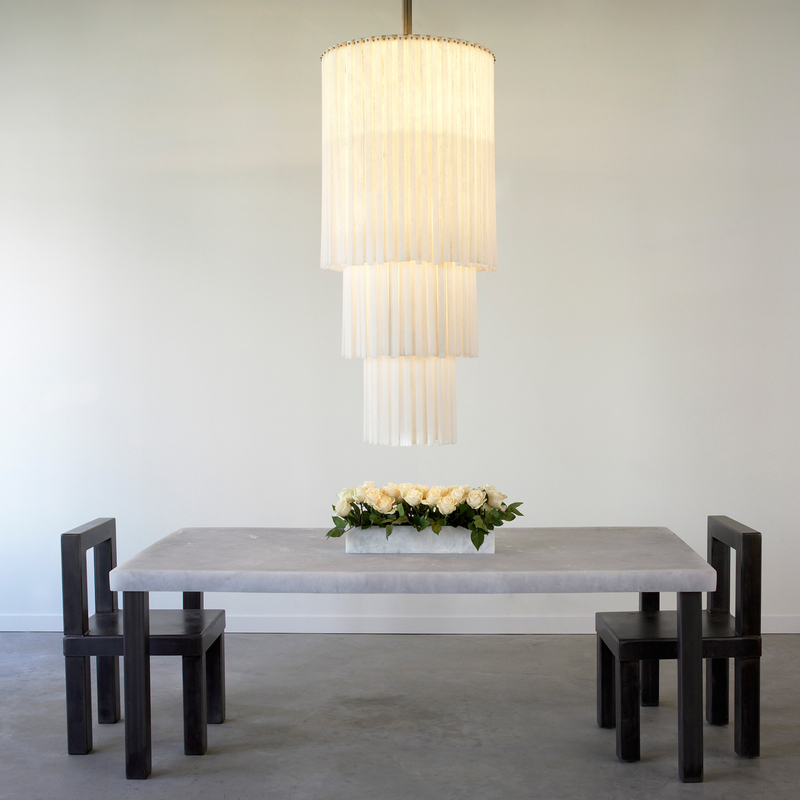 The "Fringe Tiered Chandelier" (below) is comprised of strips of resin hanging from a triple-layered frame. As each chandelier is handmade, this piece comes in forty different colours – from “ice blue” to “antique gold”, but in my opinion, the semitransparent white resin has an especially beautiful way of transmitting light through the fixture. The large scale and impressive weight of the piece will demand attention in any interior. As a student, this piece is not only an outstanding example of great Canadian design to admire but is also a “can-only-dream-of-owning” item of décor for me! Maybe one day I will be so lucky! 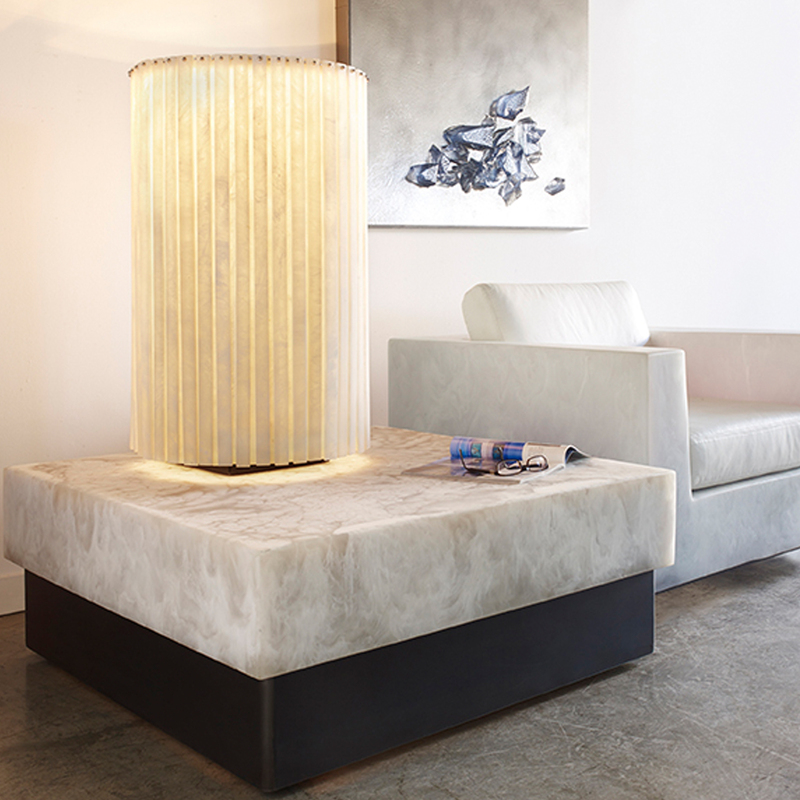 The "Fringe Table Lamp" continues the fringe theme, offering a soft light for the living room or bedroom. As Martha herself explains, “creativity and beauty should be evident in everything we do”. This ethos has clearly been instrumental in shaping the gorgeous and well-crafted goods produced in her studio. 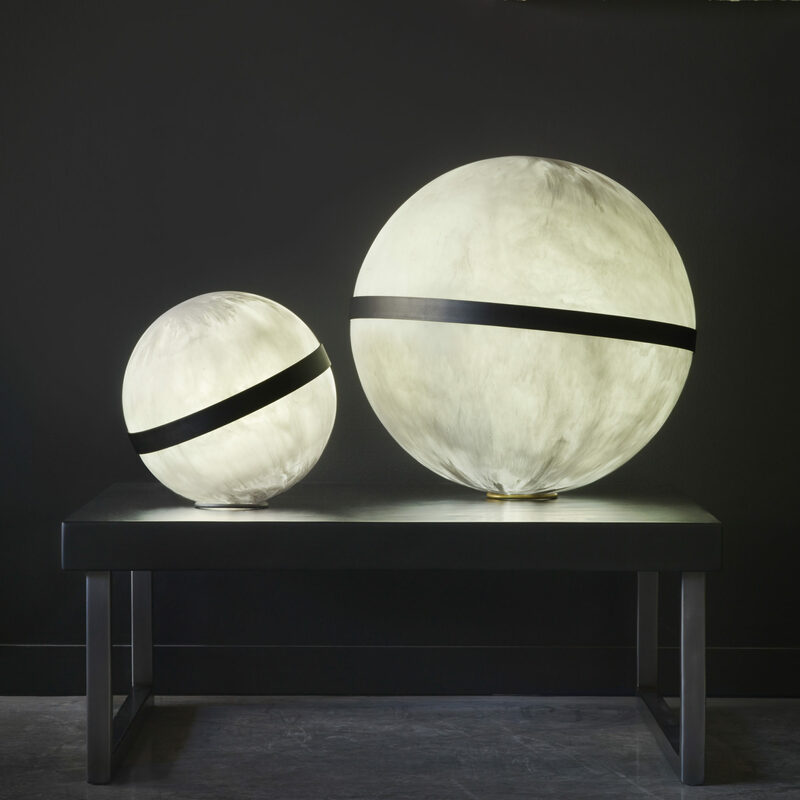 Check out the rest of Martha Sturdy’s lighting designs on her website! Also be sure to explore the site fully to view her amazing line of furniture and other artworks. All images courtesy of Martha Sturdy.